Boychik Lit: What's Wrong With This Picture? 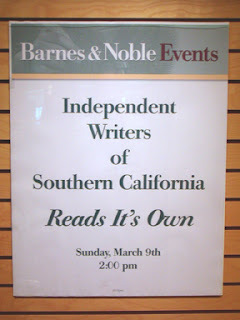 Photo courtesy Independent Writers of Southern California (IWOSC). The first person who posts a comment below with the obvious answer will receive a complimentary copy of My Inflatable Friend. BTW the books on the shelves these days aren't copy edited any better! Paula, you are obviously the first to reply. Email me your shipping address gerald@lapuerta.tv if you want your book copy.